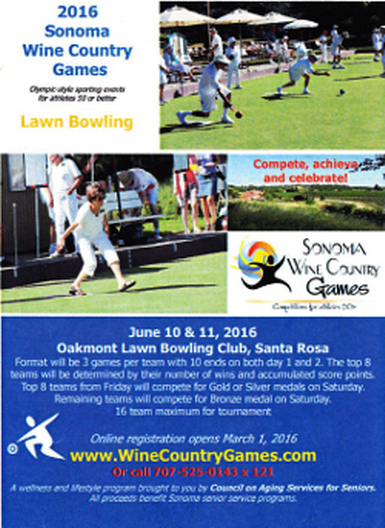 Thanks again for making the Oakmont Lawn Bowling Club - Sonoma Wine Country Games in 2015 a huge success. Other than the scorching hot weather it looks like most of the players really enjoyed competing and meeting new friends. And thank you to the many participants for their nice letters and suggestions for this year’s event. We have made some changes that should give everyone an opportunity to compete in more games. This year we will be using all 8 rinks and starting everyone at the same time. The format for this year will be "teams of three" playing three games at 10 ends each on Friday. The top eight teams will be determined by their number of wins and if needed their total points scored, and will play three games with 10 ends on Saturday for the Gold and Silver Medal Awards. The remaining teams will also play on Saturday in the same format as the top eight teams and will be competing for the Bronze Medal Award. The winners for the Gold, Silver and Bronze award will be determined by the number of wins and if needed their total points scored on Saturday. The above format may not be perfect but we are trying to accommodate our traveling teams from other clubs who wanted to play more games. Mark your calendar as there are a couple very important dates that you need to be aware of. Early registration begins on 3/1/16 at 9:00 am and it is very important to register early as we will be having only 16 teams that will be able to participate in 2016. This is two teams less than we had in 2015! 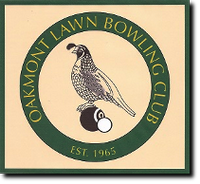 Also the early registration fee is $45 per player to participate, which will save you $5 by registering early and this fee has been determined by the Council on Aging of which none of the proceeds go to our Oakmont Lawn Bowling Club. The games will occur on Friday 6/10/16 and Saturday 6/11/16. And we will be sending more detail information to you as we get closer to June. There is an age requirement for the Sonoma Wine Country Games of 50 and older. Because of your suggestions, we feel this format will be loads of fun and an opportunity to compete with more teams. We are looking forward to an awesome venue in 2016. See each of you really soon.